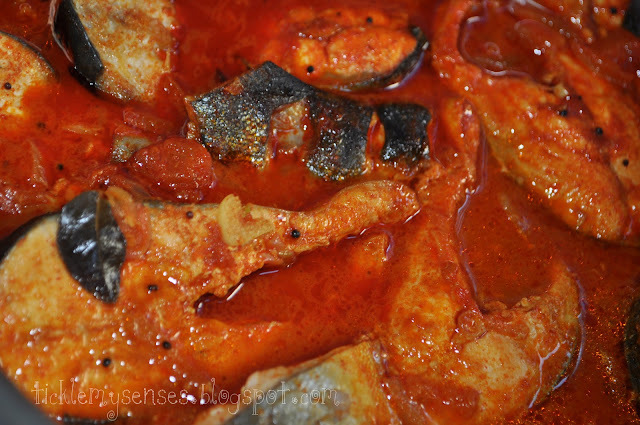 Here is another Mangalore style Hot and Sour red fish curry that is flavourful and mind blowing tasty, involves no grinding of spices and is free from coconut. The speciality of this recipe is the use of dried kokam pieces as a souring agent for the curry in place of tamarind. Kokam is the sun dried outer covering of the kokum/ mangosteen fruit. It very commonly used as a souring agent in Mangalorean/ Konkani and Marathi cooking. The fruit is also known as amsol, bhinda, katambi, looikya, sour apple or panarpuli. Substitute with tamarind or vinegar if you cannot get hold of the dried kokam pieces. This curry works well with fish like Salmon, Catfish, Trout or King fish. 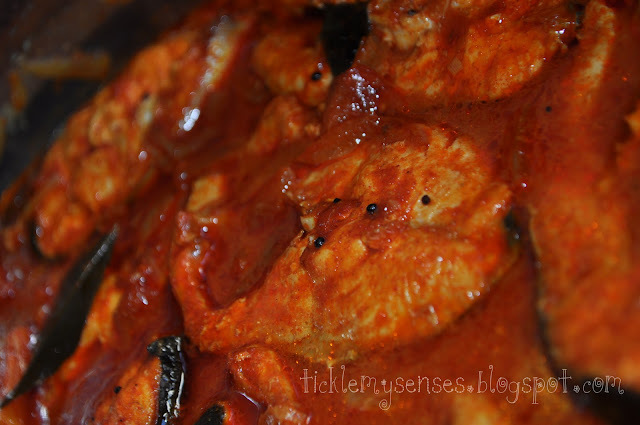 Must try it if you wish to treat yourself to a tongue tingling, toe warming, healthy fish curry. 1. Clean and slice the fish. Keep aside. Soak the cocum leaves/kokam pieces in a small bowl with a pinch of salt and enough hot water to cover. 2. Heat oil in a wide bottomed vessel pan (should be big enough to accommodate all of the fish in a single layer). Add mustard seeds and when they splutter, add fenugreek seeds. Fry till aromatic. 3. Add the sliced onions and fry till slightly softened. Then add the ginger-garlic paste, sliced garlic, tomatoes, curry leaves, 2 pinches of salt and fry till the tomatoes are softened. (Add more oil if required). 4. Mix together the red chilly powder, coriander powder, turmeric powder, and fenugreek powder with little water, to make a smooth paste. 5. Add to the onion mixture. Fry for a minute. Then add a cup and a bit of water( enough to cover the fish) to the onion mixture, add salt to taste( a tiny bit more than required) , add the soaked Kudampuli leaves with the water. Close the vessel and bring the mixture to a rolling boil. 6. Add the drained slices of fish one by one to lie flat on floor of vessel. Avoid overlapping. Close and cook the fish on a medium heat for about 7 minutes till fish turns opaque and whitish in colour and appears cooked. Avoid overcooking the fish. Taste for seasoning again add a tsp of vinegar only if required. Serve hot with boiled or white rice. Tastes better the next day. 1. If you do not have kokam/cocum pieces substitute with a marble sized ball of tamarind. Soak in hot water and extract juice. 2. This recipe calls for Kashmiri red chili powder which has a beautiful colour and mild- moderate levels of heat. If you intend to use any other varieties of chilli powder, please halve/ adjust the quantity of chilli powder accordingly. 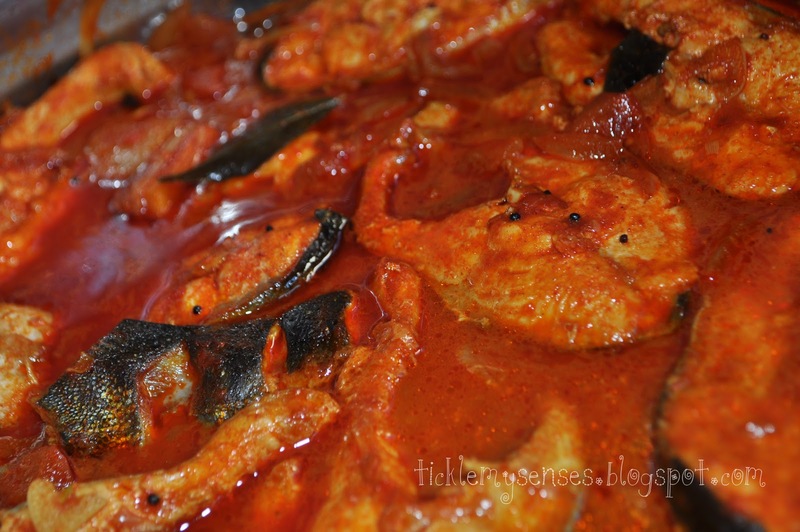 fish curry looks so spicy and yummy..
fish curry looks very spicy and delicious...lovely recipe.. 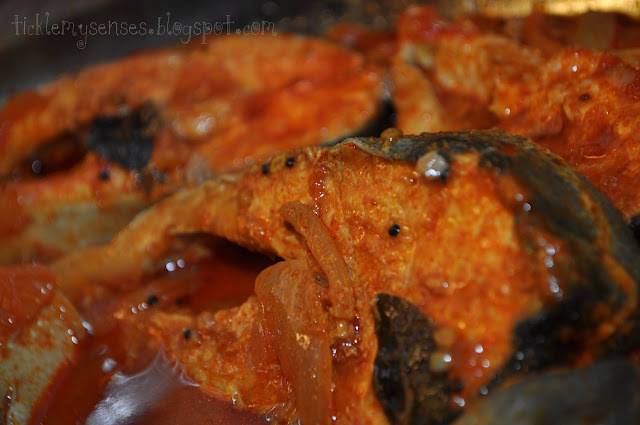 Fish Curry luks so delicious and super-yumm.Never tried a Mangalorean Dish.Hence can learn from Ur Awesome Blog of tasty recipes.Glad to follow U back. Happy to follow u dear!!! Hey there ! Greetings from Hongkong ;D Thanks for dropping by ! Really appreciate it ;) Anyway , that curry looks very appetizing . I didn't know that mangosteen ( I love mangosteen :D ) can be use as a souring agent ! With all the spices you used in that dish I bet it taste yummy ! Myself is a big fan of fish..the curry is too tempting..I have the feel in mouth..Awesome recipe. Thanks for dropping in at my place.Love to see more of you.Am adding you to my reader as well.Cheers ! This is a lovely fish curry, I love the spicy profile here. This is my first time on your blog and I love it. I love Manglorean food a lot and this fish curry reminds me of home (Mumbai). It looks so yummy. Would love to eat that with some steamed white rice. you have made my favorite food. Love Manglorean cuisine. I love all their curries and this one with fish looks exceptional. Soraya....how did it turn out???? Thank u for this amazing recipe.